Photo by Mark Pokorny ©2014 Warner Bros. & Metro-Goldwyn-Mayer. All Rights Reserved. Photo ©2014 Warner Bros. & Metro-Goldwyn-Mayer. All Rights Reserved. Image ©2014 Warner Bros. & Metro-Goldwyn-Mayer. All Rights Reserved. 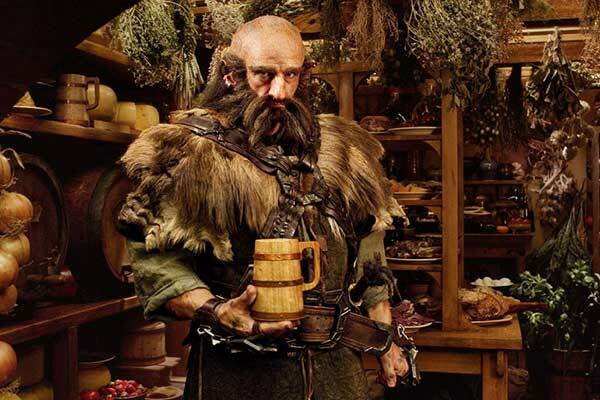 Dwalin [Graham McTavish], one of the Company of Dwarves, raids Bilbo’s pantry! Photo by Todd Eyre ©2012 Warner Bros. & Metro-Goldwyn-Mayer. All Rights Reserved. Photo by James Fisher ©2012 Warner Bros. & Metro-Goldwyn-Mayer. All Rights Reserved. 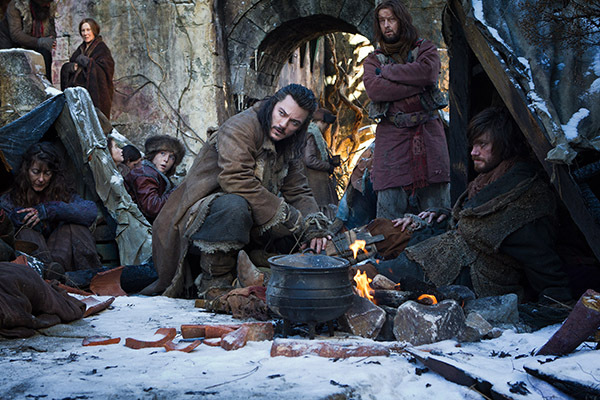 Luke Evans, Richard Armitage, John Callen, Peter Hambleton, William Kircher, Graham McTavish. Photo ©2013 Warner Bros. & Metro-Goldwyn-Mayer. All Rights Reserved. Peggy Nesbitt, Mary Nesbitt, John Bell. Photo ©2014 Warner Bros. & Metro-Goldwyn-Mayer. All Rights Reserved. 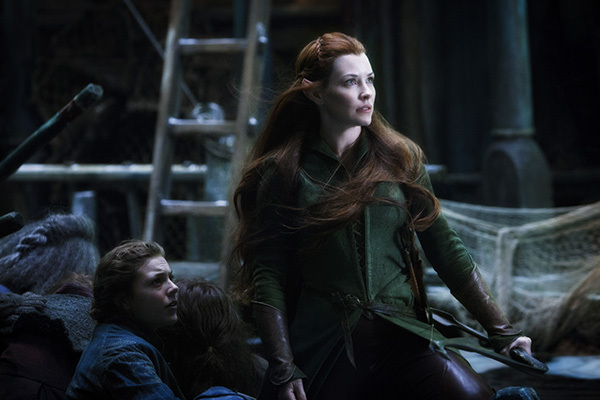 Sigrid: Peggy Nesbitt. Photo by Mark Pokorny ©2014 Warner Bros. & Metro-Goldwyn-Mayer. All Rights Reserved. 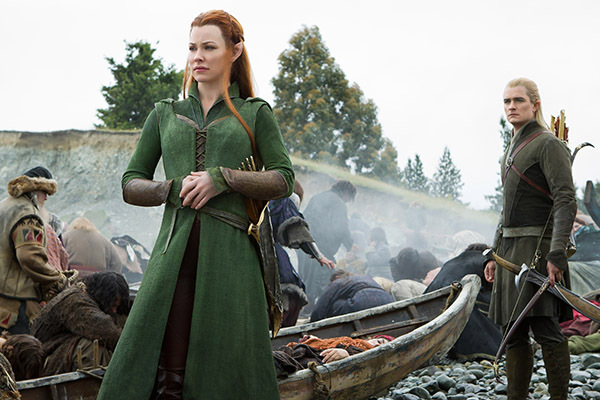 Tauriel [Evangeline Lily] and Legolas [Orlando Bloom], Prince of the Mirkwood Realm, come to the aid of the displaced residents of Lake-town…Half a mile of beach was dressed with their effects! 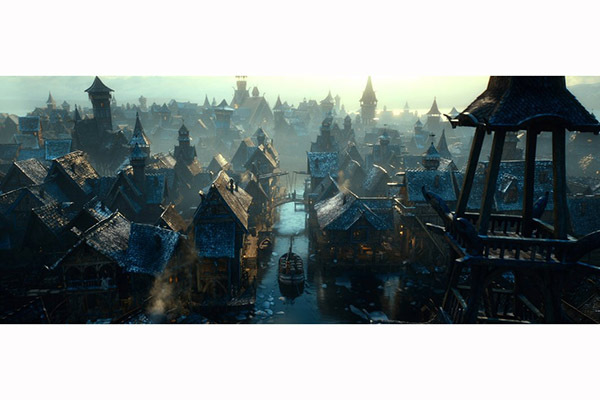 Tolkien described Dale as the “orchard city, colorful and abundant with foliage…\"
©2014 Warner Bros. & Metro-Goldwyn-Mayer. All Rights Reserved. Photo by Todd Eyre ©2014 Warner Bros. & Metro-Goldwyn-Mayer. All Rights Reserved. Photo by Mark Pokorny ©2013 Warner Bros. & Metro-Goldwyn-Mayer. All Rights Reserved. 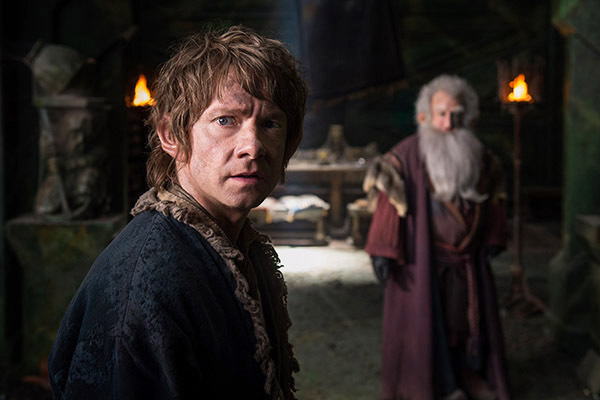 THE HOBBIT trilogy tells a continuous story set in Middle Earth 60 years before THE LORD OF THE RINGS trilogy, which Academy Award-winning filmmaker Peter Jackson and his team first brought to the big screen.The tale of Bilbo Baggins [Martin Freeman], the Hobbit who embarks on a wondrous and dangerous adventure in The Wild with Gandalf [Ian McKellan], the Grey Wizard, and with the Dwarves of Erebor and their king Thorin Oakenshield [Richard Armitage], grew in the telling to birth the resonant themes that are woven throughout the Tolkien canon—the bonds of friendship, the nature of honor and sacrifice, the corruption of wealth and power, and the quiet courage of the unlikeliest of heroes, which may hold even the greatest forces of evil at bay. “Everything we’ve seen—who these characters are, what each of them is fighting for—leads to this moment,” Jackson imparts. 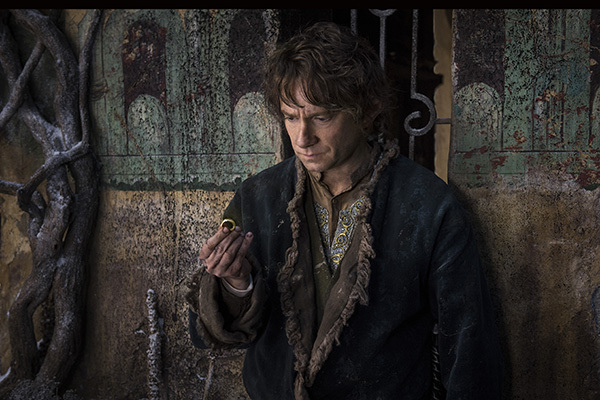 “I think it’s the most powerful and emotional of the three HOBBIT films, and honors each character with whom we’ve gone on this journey.” To bring these worlds to life, Jackson has relied on the creativity and skills of Production Designer Dan Hennah, Set Decorator Ra Vincent SDSA, Set Decorator Simon Bright and the massive teams of artisans, craftspeople and crewmembers they oversaw. The community that has evolved during the making of these films and the first trilogy, LORD OF THE RINGS, sprung from the heart of many who had settled in New Zealand… an alternative lifestyle in contrast to consumerism and materialism, in keeping with the some of the worlds Tolkien envisioned…artists and artisans emphasizing a gentle imprint on the environment, an appreciation of nature and an openness of spirit. Set Decorator Ra Vincent SDSA reflects that mindset. He talked with SET DECOR about some of the specifics of making the latest and final film of the series, as well as the entire trilogy. One of the greatest things about my job as set decorator is that I was privileged to work with some of New Zealand’s most talented artists and crafts people over the 4 years we worked on this project. 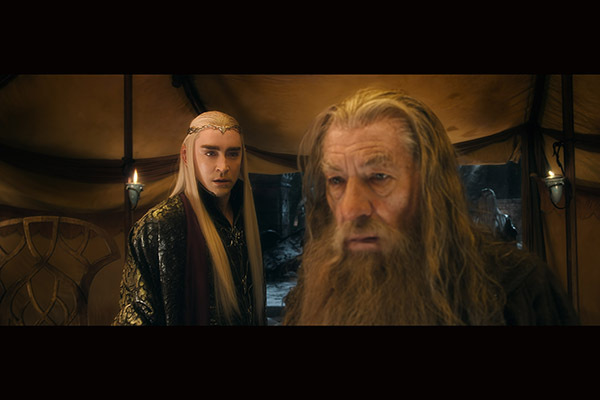 And in a lot of cases it was the same people we had worked with 10 years earlier on the LORD OF THE RINGS trilogy. It’s been a fantastic journey to go on with our friends and peers. Many of us began in our early twenties, so have come through marriages, births of children and, unfortunately, the passing of some good friends. It has been a big part of our adult lives and we have made some lifelong friendships. 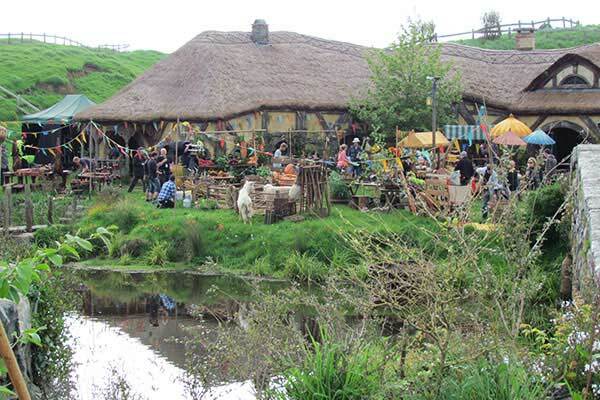 SET DECOR: Other than the stunningly beautiful, uncluttered countryside, why has New Zealand been a perfect setting for the creation of the films? Vincent: New Zealand was the best place to make the films because the industry here is so young and we didn’t put any limitations on ourselves as to what we could achieve. There was a real feeling of pride and unity…it felt like the whole country was behind the project. And of course this is where Peter Jackson lives! 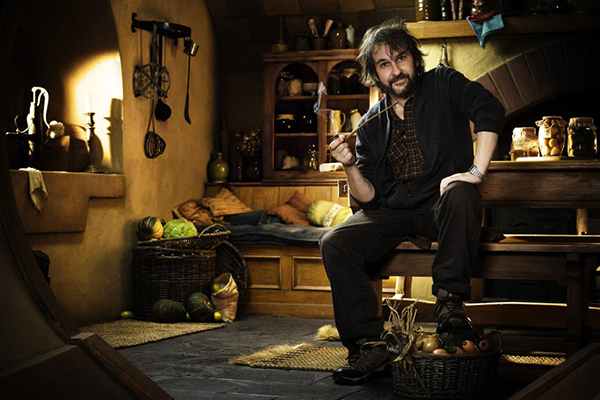 Vincent: We were really just responding to the book, which captures the notion of stepping out into the unknown and of somebody as small as a Hobbit accomplishing big things, things he never imagined he would be faced with. So we, in turn, were conceiving worlds we had never imagined and creating them using new techniques and methods we’d never used before. 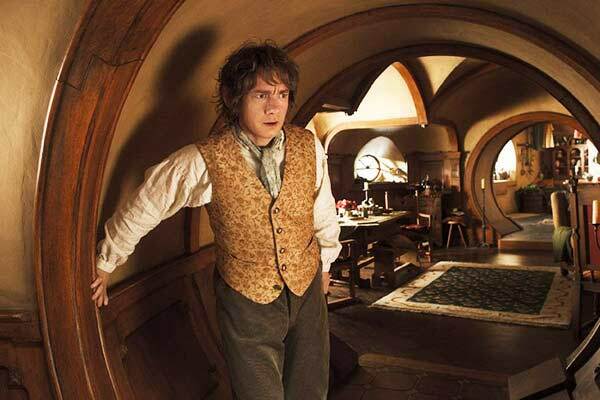 SET DECOR: Is it true that all three HOBBIT films were filmed together? Vincent: Yes, all three films were filmed together over three years…and we had one-year prep. 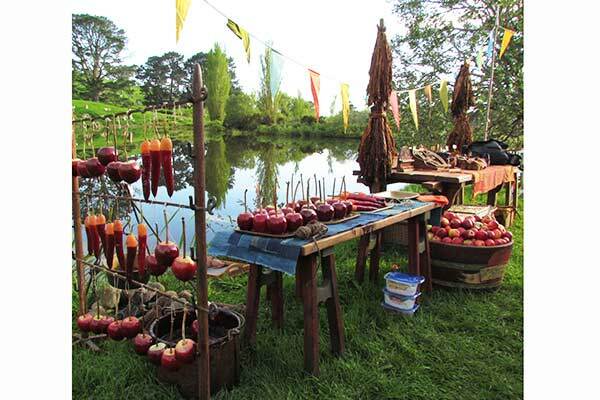 The biggest consideration in that first year of prep was the building and planting of Hobbiton through the winter so that it would be in full bloom when we would be filming there in the summer. Vincent: I was fortunate enough to work with Dan on the LOTR trilogy and KING KONG before starting on the HOBBIT trilogy. We have an easy way of working in that we have a similar aesthetic and an open dialogue about the way we think things will eventually look. Dan is a great storyteller and is very visual with his instructions, which I think I respond to well. He allows everyone within the Art Department to contribute their ideas, promoting creativity and working to people’s strengths. 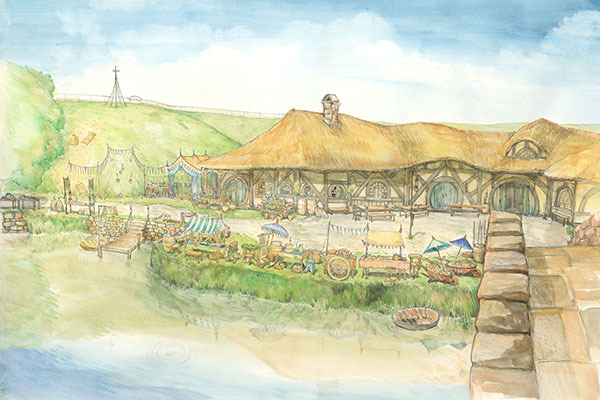 Vincent: The process of designing a set environment and its furnishing in a place like Middle Earth is such a holistic thing that every detail becomes part of the negotiation, so the architecture speaks to the furnishing and the environment becomes a complete design process. Simon and I collaborated on budgets, time frames and design elements on all three films to keep the department running smoothly. Vincent: A lot of our crews were craftspeople from outside of the film industry. The reason for this is we wanted to create as much hands-on reality in our environments as possible and keep the integrity of the materials with which they are created. We wove our own fabrics, made our own ceramics, built our furniture from exotic timbers, and all of our glassware was hand blown. 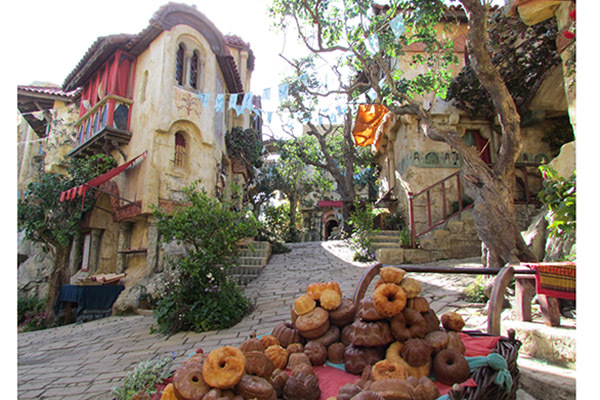 The difference was, instead of having a big prop-making department, it became more like a village of artisans working together to a VERY tight schedule! 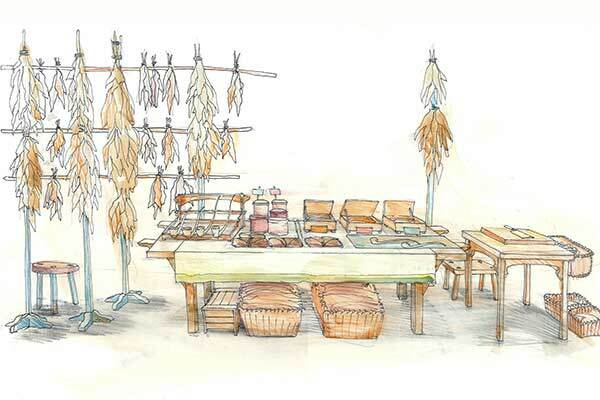 Vincent: Through discussions with the designer we come up with an idea of what our finished product wants to look like and what I will do is take the very early construction plans and do a dressing layout and then a dressing illustration. The illustration serves to describe very broadly the styles of furniture required and the quantities of objects needed to furnish an environment. It also instructs the palette of the set and the relationship of the objects inside it, plus it helps me form a budget. 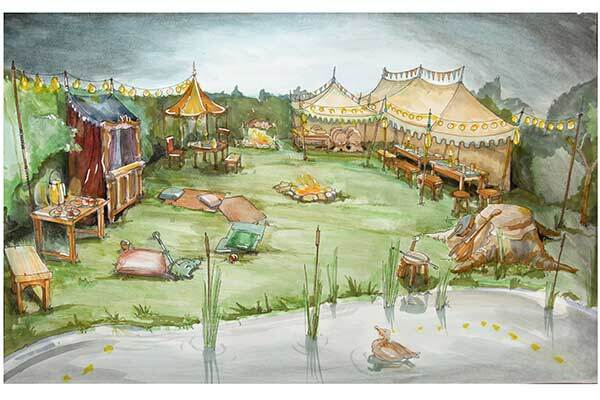 These illustrations are then given to the scenic artists, to the set dressers involved in gathering the elements and to the props designers who extract each element from the drawing and draft them up for the makers. 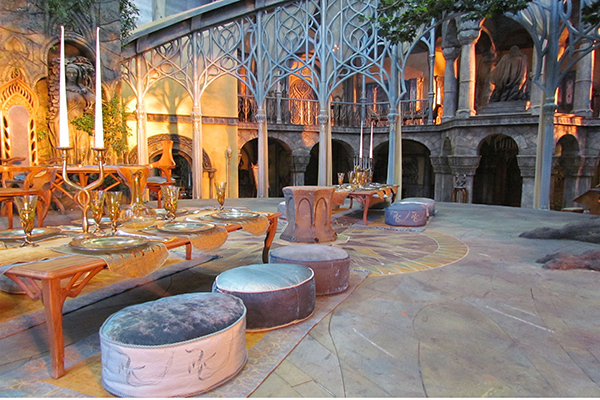 SET DECOR: You were a sculptor for the LORD OF THE RINGS trilogy. Did you do any sculptures for this film/this trilogy? Vincent: During the pre-production phase I sculpted some maquettes for Erebor because the aesthetic that we had talked about was very difficult to describe in any other way than to make some 3-dimensional forms. The geometric nature of the dwarves environment related directly to the soft furnishing designs, the furniture, prop and hand-prop designs…and sculpting these forms was the best way to create a dwarven visual language. 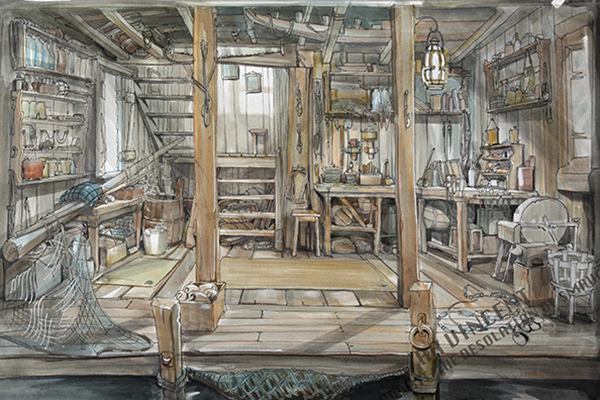 SET DECOR: Tell us about the artists you employ…How many…for what elements? Vincent: So many people were involved, a partial list would include…. 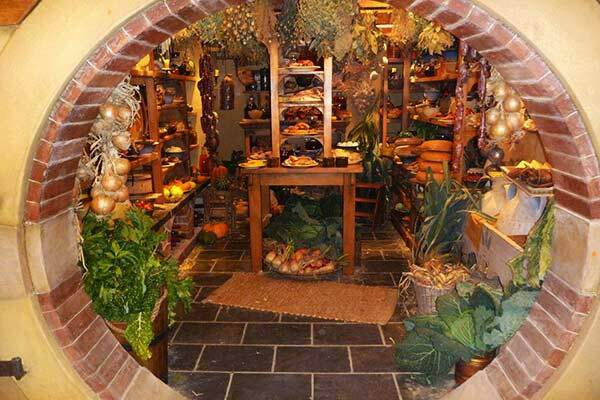 Vincent: Beorn’s house was built as two different sets, we went to an incredible location in Queenstown called Paradise and built the exterior of Beorn’s house and gardens. 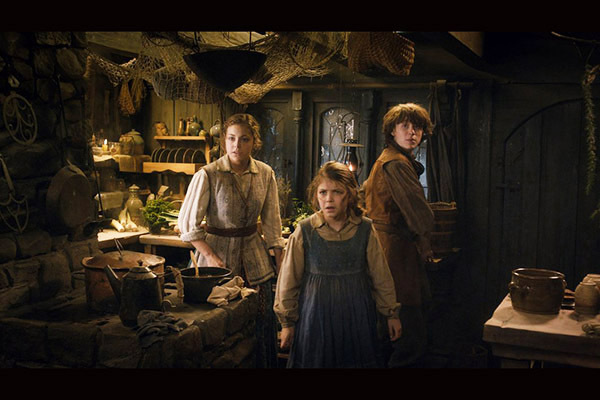 The set was massively over scale to make our main cast look like little dwarves in the realm of a giant shape shifter. 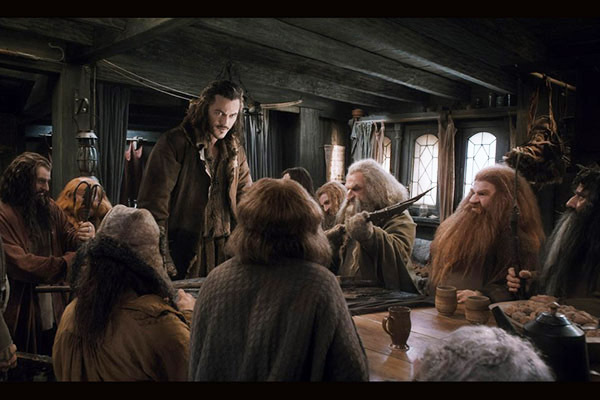 Beorn, in story terms, is about 9 feet tall, and our Dwarves average about 4 feet. So to get a 6-foot actor to look like he’s 4 feet tall in a house that belongs to someone more than twice his supposed size means you need to make everything 2x bigger than life. 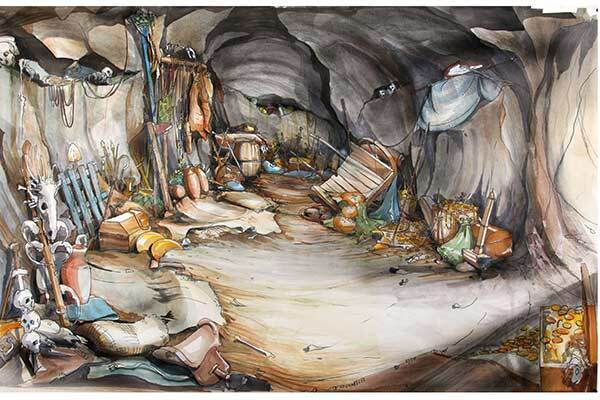 Beorn’s bedding was knitted using double-sized knitting needles from wool that we handspun on an adapted spinning wheel. 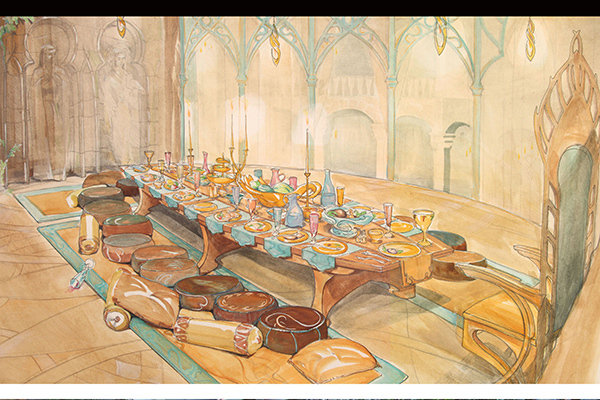 From his hand carved wooden furniture to the oversized cutlery everything was built double size. The interesting thing about over-scale set dressing is that you really start to notice the vast gaps in-between objects…this, I think, gives more emphasis on the objects’ positions on set. 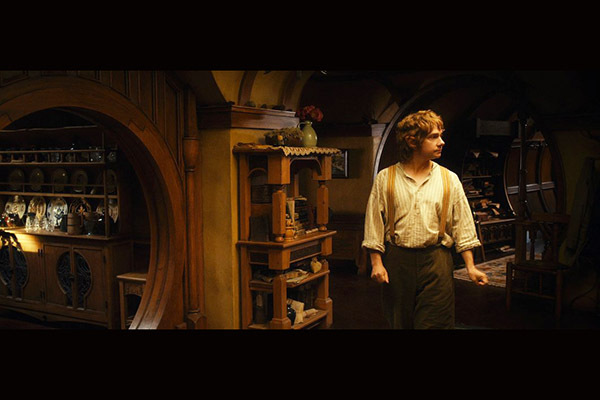 SET DECOR: Speaking of scale, please tell us about Bag End, Bilbo’s house. 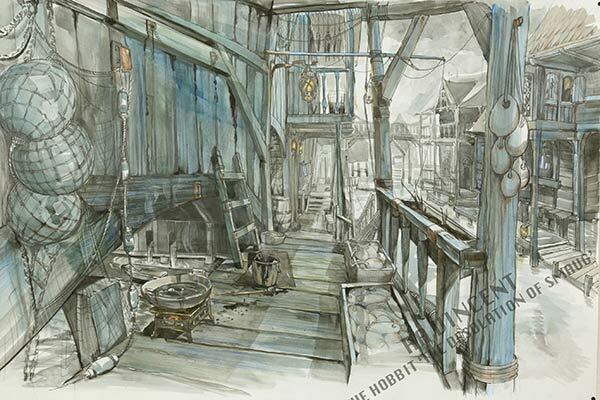 We visited it in the previous films, but in this one we see most of his possessions either spread about the yard being auctioned, or carried off by villagers and the interior completely ransacked! Please tell us about the before and after of this delightful set! 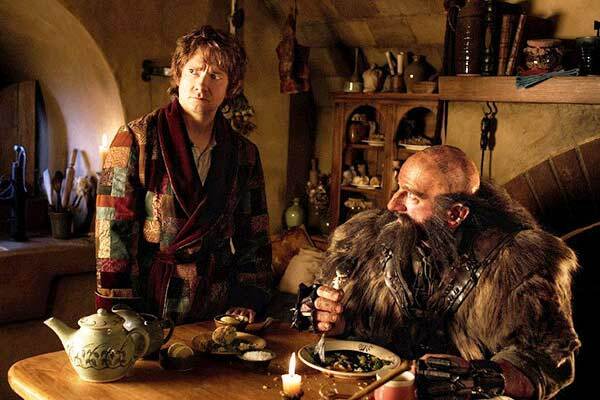 Vincent: Bag End was the first set we shot when we started film one of the HOBBIT. 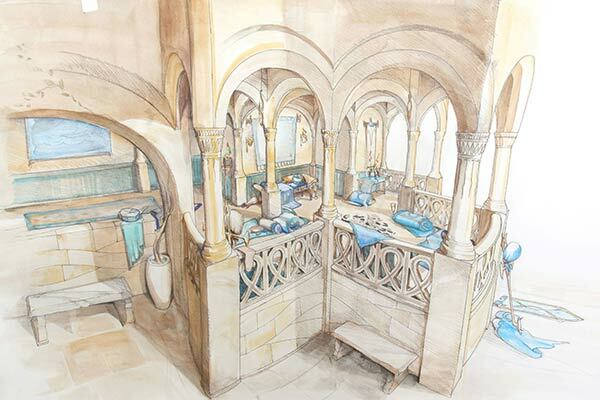 It was a familiar starting point for the cast and for the art department. 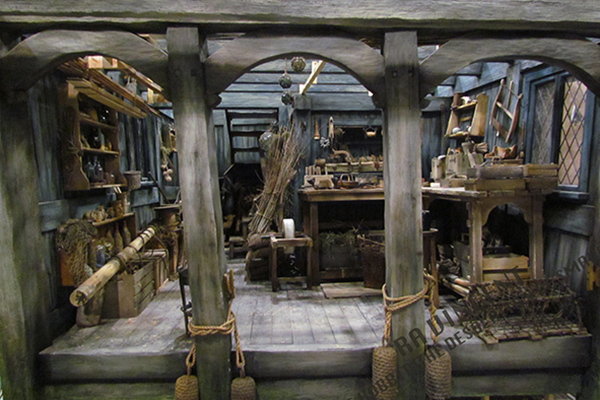 Building Bag End from scratch was great because we had good reference to use from the previous LOTR set build, but because we were about to shoot these films at a higher frame rate and in super high definition we had the opportunity to make every single detail in that house immaculate. On those first few days, we shot the start of the film in that interior set, and then only knowing vaguely what would happen three years and two films later, we shot the end of the auction scene in that same week as well! 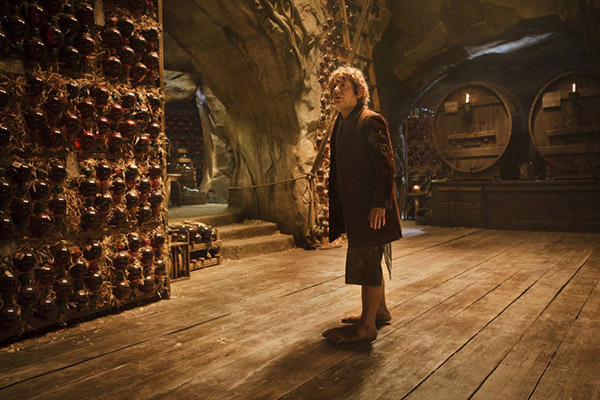 SET DECOR: Devastation seems a bit of a theme for the last of the HOBBIT film trilogy. Lake-town, which was introduced in the second film, is destroyed in this one. 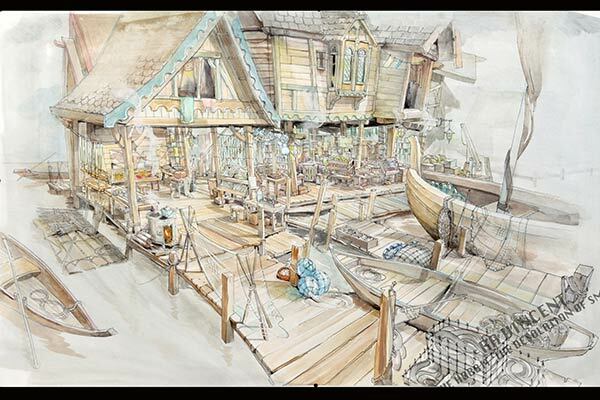 This is a wooden village on the water, with inter-connected boardwalks, waterways and wharves, all completely outfitted in great detail. 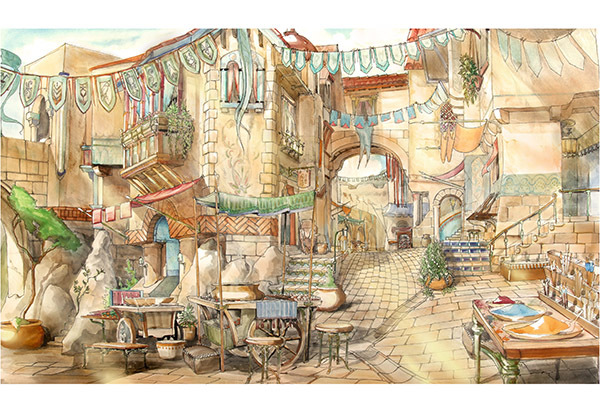 Please tell us about set decorating for both…the tightly rambling village and the fiery destruction of it! Vincent: Almost all of the dozen or so Lake-town sets that were built had a dual purpose. The areas that we visited in the second film feature in the third, and we get a chance to go a little deeper into some of those hero buildings like the mayor’s barge house and the cell tower that is built off the side of the town hall. And, of course, we revisited Bard’s house. Many of these sets were both interior and exterior sets at the same time. This meant that we could build an actual town as big as our biggest sound stage would allow and shoot anywhere the director felt on the day. Some buildings were already prepped with fire board and breakaway components a whole film in advance. 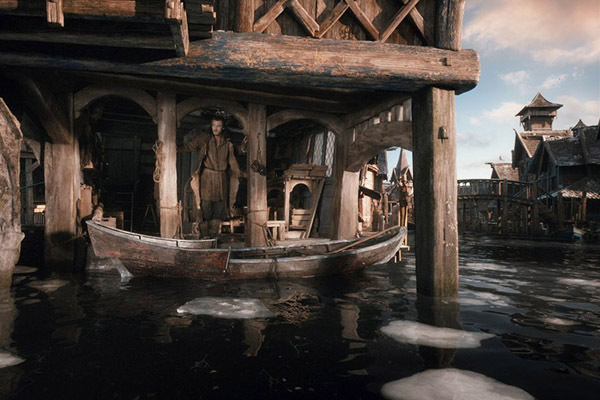 Vincent: One of the loveliest location set builds was the shores of Lake-town, shot on location in Twizel, deep in the south Island of New Zealand. Lake Pukaki was chosen because of the snow-covered alpine mountains so close to the icy waters of a huge freshwater lake…crystalline water and sky. We loaded 9 twin-trailered trucks with set dressing and sent them 350 miles south of Wellington to Twizel, where a team of fifteen set dressers and swing gang on a remote part of the lake dressed half a mile of beach with the remains of Lake-town and the makeshift tents of the Lake-town survivors. The City of Dale was built on a huge site half a mile from the studios in Wellington. The snow was an amazing added effect against the blackened buildings, and made you feel cold in the middle of a summer day of filming. 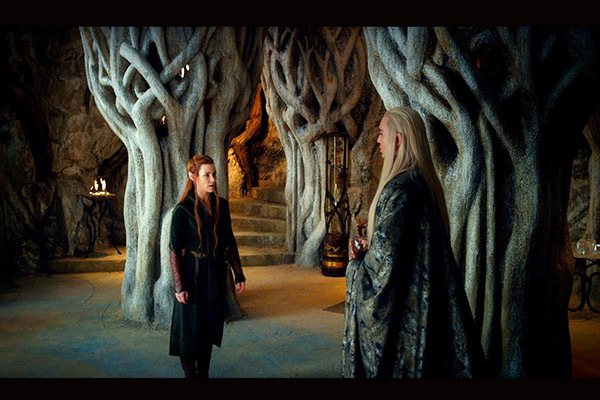 Vincent: Thranduil’s realm had a few nice design rules that we decided on early in pre-production. His kingdom was as if it were beneath a huge oak tree. The furniture was carved from the living roots of the tree, and through that timber ran beautiful amber veins. We had developed a method for pouring amber into cavities in timber and then cutting tabletops and woodturning bowls and cups from the resin and wood. The Woodland Elves had a much sharper earthy and more serious aesthetic than their more ethereal cousins, the Rivendell Elves. Their fabrics were made from heavily devoréd materials and textured in beautiful camouflage ways. As well as colors of the forest, they also had an affection for white gems, and we often added silver thread and silver gilding to their objects. 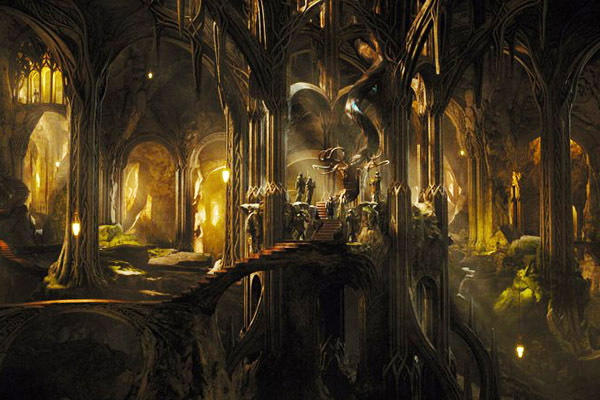 The lights that decorate Thranduil’s realm are huge resin lamps, which helped impart a honey warmth to the set and really showed off the timber. 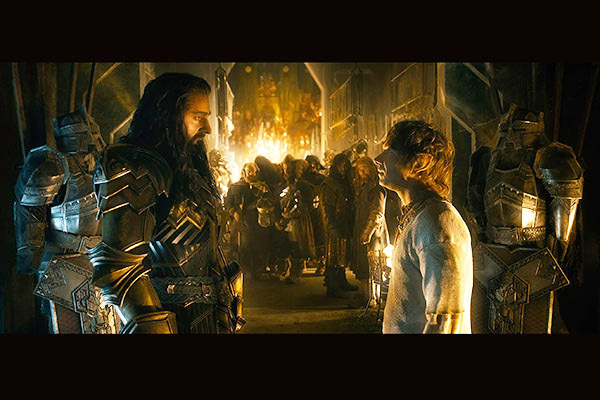 SET DECOR: Erebor, the dwarves kingdom inside the Lonely Mountain, which Smaug had captured for his own domicile, is huge within…Please tell us about the fascinating “ancient” equipment the dwarf community had created…and, of course, the stash of gold! 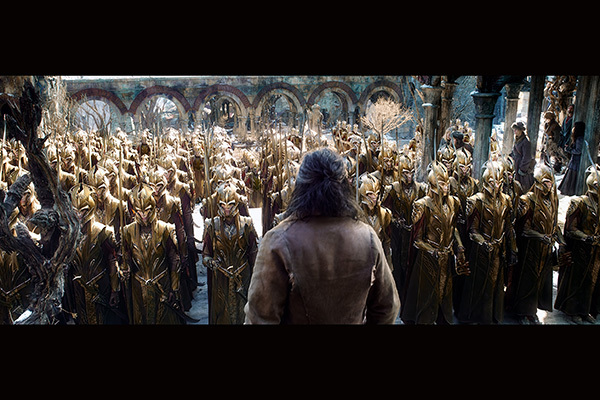 Vincent: Erebor’s gold mountain was made with approximately 240,000 brass and gold plated embossed coins. There were five different styles of coin, which were carved into the punches of a sheet metal perforating machine. The young sheet metal apprentice spent a good month punching these. We spun over one thousand brass goblets and bowls and used hundereds of kilograms of crystal to enhance the sparkles. Something that also helped lift the effect of the gold was the use of some colored fabrics, these were subtle but they helped you see the brilliance of the gold. The main treasure set was built 40-feet by 70-feet long and 20-feet high. Built over scaffolding and sheets of molded rubber mats, the gold was heaped a good ten inches thick. The upkeep on this set was never-ending. 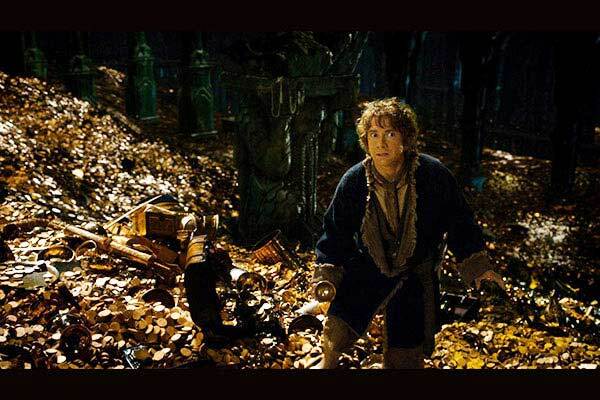 Every time somebody walked on it, the gold would slip and gradually make its way down to the bottom of the pile! 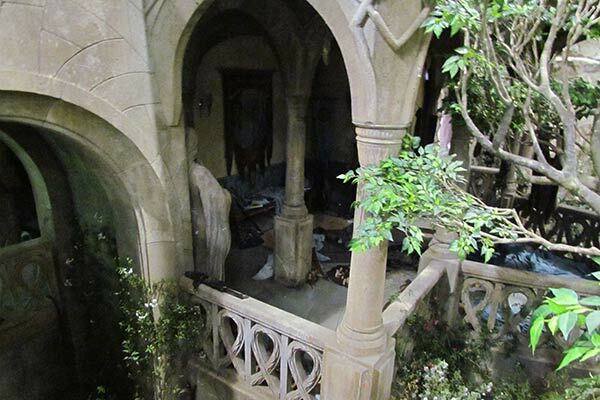 SET DECOR: Was there set decoration involved in the sets for the frightening exteriors of the ruined fortress & catacombs of Dol Guldur and the Dwarven outpost of Ravenhill, which has become the battle station of the evil Orcs? Vincent: For Dol Guldur, the set decoration team made the rusty steel traps and torture devices, and distributed 150 skeletons. We also painted oak and beech leaves different shades of black to help with the wind effects on the set. At Ravenhill, we used destroyed Dwarven furniture and several tons of shredded black fabric, which came from hundreds of old police uniforms. Did you provide sample elements, sketches, fabric samples, miniature sculptures, etc for them to have actual pieces to work with/from? Vincent: The biggest CG component was the need for set extension, which were the areas in the background where we were limited by studio space. Each environment was designed by Dan and we built as much as possible, and then the visual artists took the design and completed set extensions where necessary, under our direction. For CG characters, a lot of this was done with motion capture on physical sets, we provided digital versions of a lot of set dressings and props so that they could be incorporated into scenes by the digital effects team. SET DECOR: Do you have a favorite set among all of these incredible ones?!! Vincent: My favorite set was Lake-town. We were able to develop a whole culture through architecture and objects. In each Lake-town set, anywhere you went you were 100% immersed in that environment, there weren’t any ’backs’ of sets the houses were finished inside and out and dressed in minute detail. SET DECOR: What were some of the most interesting aspects about the set decoration for this film, this trilogy? 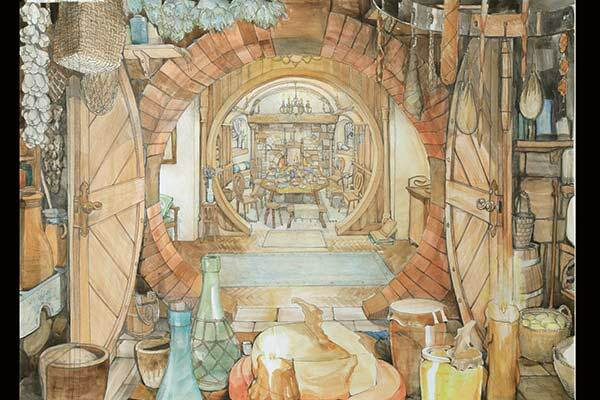 Vincent: The most amazing thing about decorating Middle Earth was that we were only ever limited by our imagination, and for that we had a great story to follow and some magnificent artists interpreting those words. The ability to make anything you want makes the job both easy on one hand and incredibly challenging on the other because, like watercolor painting, you need to know where to stop. 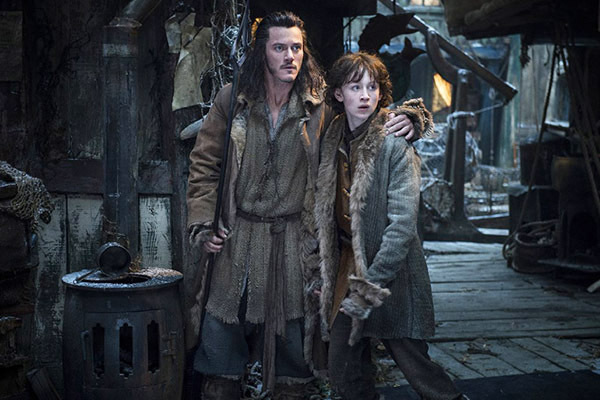 Vincent: After spending so many years on the ground as a sculptor and being surrounded by Middle Earth, when I returned to it for the HOBBIT, it felt so familiar and exciting to be back. SET DECOR: What did you learn from the first film that you applied to the others? Vincent: The first film really set up how we could work together as a crew. There were at times up to 120 people working in the set dec/props department and after a year of working together we really started to understand one another and could have continued producing work indefinitely. SET DECOR: What have you learned from making these films? Vincent: That these films were a rare event that will never be repeated. 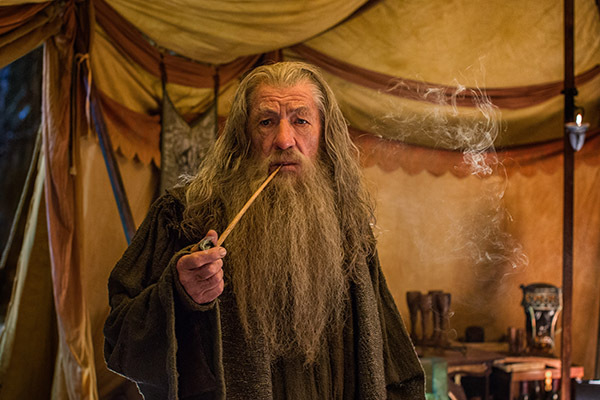 The LORD OF THE RINGS was an amazing experimental time in cinematic history, and the HOBBIT mustered everything it could to be even better. Most movies don’t have that amount of pressure behind them to succeed. SET DECOR: What inspires you? Vincent: My inspiration comes from my children and the natural world. All of life is to be lived and if its in a creative way then all the better.